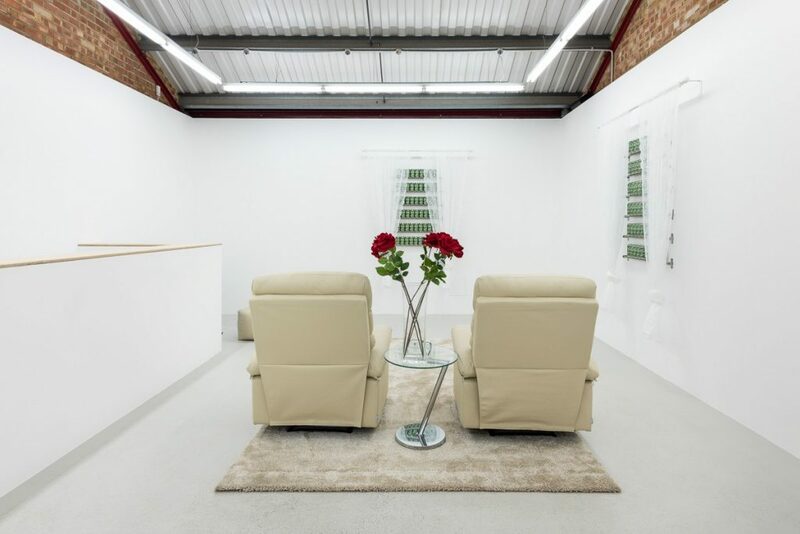 Annka Kultys Gallery is pleased to present recent video works and installations by the London-based artist Stine Deja marking the artist’s second solo show with the gallery. The exhibition, titled There’s Life Outside, is intended as an exposé of our increasingly artificial world. 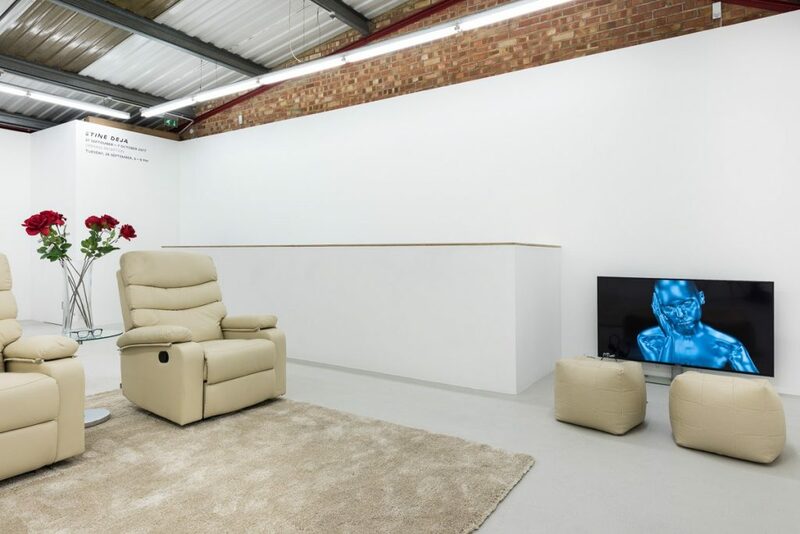 For the show, the gallery space has been transformed into a fragment of a living room, with the key archetypal elements of a living room used all being man-made and synthetic versions of the ‘real thing,’ such as vinyl-clad recliner chairs for example. Into this space Deja has placed two installations in the form of windows, complete with curtain rails and accompanying gauze curtains, which in the normal course of things would furnish the gallery goer with a view of the world beyond the gallery space, the word outside. Yet in both, the anticipated view is obscured by rows of cans of Coca-Cola’s recent ‘Life’ brand of cola. The installations highlight the ironies and contradictions within Coca-Cola’s marketing strategy for the Life sub-brand. For example, having a multi-national global corporation name its latest product after that most organic of processes, i.e., life itself, only emphasises the contrast to the artificiality and lifelessness of the product. The corporation claims the product is ’sweetened by natural sources’ and uses the colour green in the livery of the Life cans, the colour universally evocative of health and environmental awareness, in an arguably cynical attempt to associate the product with those same notions of health and well-being. Yet by presenting the product as somehow life-enhancing or life-affirming, Coca-Cola cloaks the company’s real purpose of selling a mass-produced and mass-marketed sweetened cola drink. The artist’s decision to use a product of the Coca-Cola company to probe the relationship between the genuine and the artificial is significant, given the company’s iconic marketing campaign of the early 1970s with its famous tag-line “It’s the Real Thing.” Deja’s windows invite gallery visitors to dwell upon the extent to which global corporations are bringing us closer to or further from whatever it is that is connoted by the notion of life today. The windows are complemented in the gallery by two video pieces by the artist: The Perfect Human and Self-service. 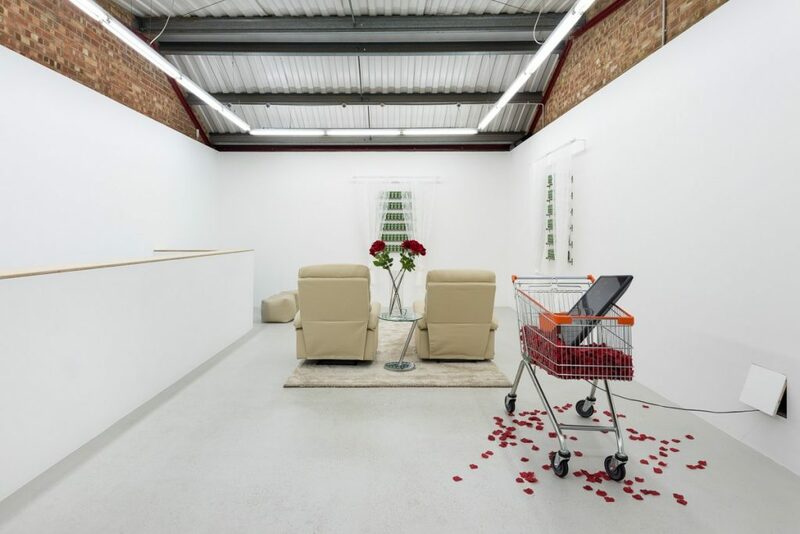 Self-service features the computer-generated voice of an automated supermarket self-checkout, overlaying images of rose petals floating in air around a rotating shopping trolley. 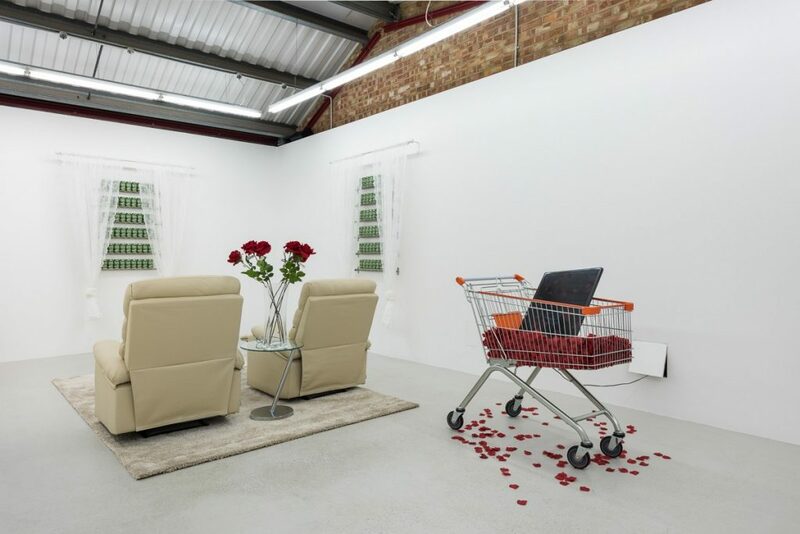 The saccharine petals romanticise what has now become the anonymous and choreographed experience of contemporary grocery shopping, while simultaneously fostering a nostalgia for a not forgotten near-past when buying groceries implied idle chit-chat with a real check-out operator. Deja’s The Perfect Human is an ontological examination of what it means to be human. It explores how we become who we are, how we process our experiences and how given roles affect us, employing keen observation rather than by positing hard answers. Drawing on an original 1967 video work by Danish filmmaker Jorgen Leth, The Perfect Human reworks and digitises Leth’s observations on what it means to be ‘perfectly’ human, employing an unseen commentator-observer to interrogate and analyse the video-subject’s human perfection. 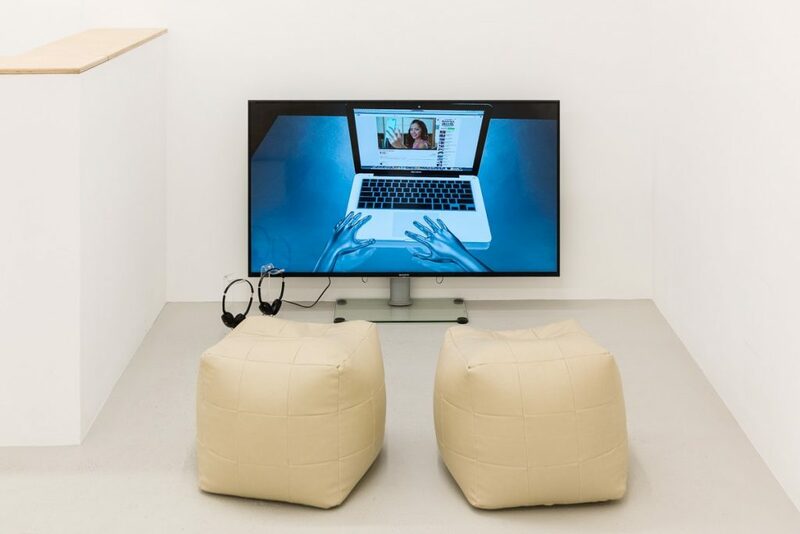 Yet Deja’s version of the human is no longer a simple biological being inhabiting say a clinical white room, but rather is suspended in the virtual reality of the computer screen – connected yet alone. There’s Life Outside asks whether in our increasingly artificial world we risk losing what it means to be alive. 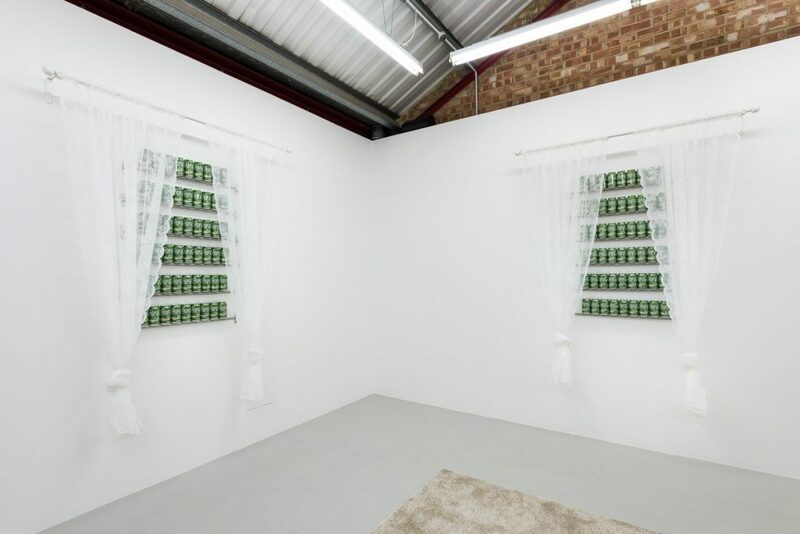 Stine Deja ‘There’s Life Outside’ Installation view at Annka Kultys Gallery, London, 2017.